Get Rid of Hockey Equipment Stink! The sport of hockey was recently rated as one of the stinkiest sports. To any hockey parent, this should come as no surprise. I was once backstage at a concert, and the facility used to be home to a college hockey team (10 years prior). Those poor locker rooms still smelled as if the hockey players were present for a period intermission. Being a more expensive sport with all of the pads and gloves needed, purchasing new equipment each year is not an option. The other alternative of driving to and from long road games with your head out of the window in the dead of winter like Ace Ventura, is also not feasible. But Installerstore has a more economical (and safe) option to rid your hockey pads from the stank. Check out the GREAT line of Deodorizer products offered on Installerstore.com. Products so powerful, yet safe, that they are used in hospitals and schools. They will eliminate even the most offensive odors and will even kill fungus and bacteria. Get rid of the smell with Host Brand Odor Exploder! Strong and safe enough for hospitals, hotels and homes. Deodorizes not only upholstery and fabric, but carpet, wood, etc. This product is effective enough to remove stinky smells, but is also safe to use around children and pets. If Skunk-X by Tech can remove skunk smell, it can remove hockey pad stink! This odor remover doesn’t mask odors, it gets rid of them. Skunk-X is made with selectively-adapted organic salts, specially created surfactants and natural sassafras. Instant odor removing! This Total Solutions Live Micro 535 is an enzyme odor remover has a formula that actual “digests” waste and odor. This natural odor remover contains no chemicals and is an organic enzyme odor remover. With any new product, always test the product in a small inconspicuous area to ensure desired results. With hockey season to begin soon, DON’T DELAY! Remove that hockey stank before it becomes worse this upcoming season. To view the full list of stinky sports, visit this blog link. 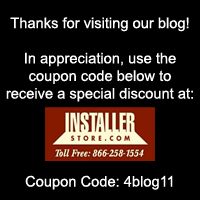 Because of the popularity of this blog post, we are offering 5% off all odor removing products in the “Deodorizer Category” on Installerstore.com. Save 5%. NO COUPON CODE NEEDED! The 5% discount will automatically apply during checkout. No other discount or coupon code can be applied to the Deodorizer products. The 5% discount can only be applied to products in the Deodorizer Category on Installerstore.com. HURRY!! Promotional discount only valid during the month of September.